At Automotive Machine Works we have expertise in many fields. Our hydraulic technician is also a certified welder. This allows us to do a wide variety of jobs while we are out in the field. Our capabilities allow us to weld and fabricate different materials and sizes to get the job done. Here are two examples of welding and fabrication of hydraulic cylinders our technician has done. 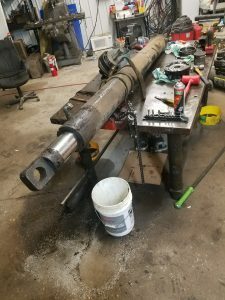 One project that came into Automotive Machine Works was this hydraulic cylinder with a broken outside tube. The end of the tube housing was flared and stripped, it needed to be fabricated to fit back on the cylinder. We welded the housing onto the tube, then we bent and welded the bottom of the tube to the cylinder. Lastly, we welded the other side of the housing to the cylinder to complete the circuit. Our trained technician has over 10 years of experience in hydraulic cylinder services. We pride ourselves in producing the best quality repairs in the industry, with great customer service. Manufacture new shafts, head glands, pistons, cylinders, and barrels. In some instances, your hydraulic cylinder may be beyond repair and you cannot order a new cylinder for your equipment. At Automotive Machine we produce high quality, custom hydraulic cylinders. See examples of the custom rebuilds we have done here. Automotive Machine prides ourselves in producing the best quality repairs in the industry, with great customer service. We offer pickup and delivery of equipment, and mobile servicing, where our technician will come to you for general hydraulic repair. We would be happy to work with you in solving your hydraulic needs. Whether it be hydraulic work or fabrication and welding, we can help. Contact us for a quick estimate!